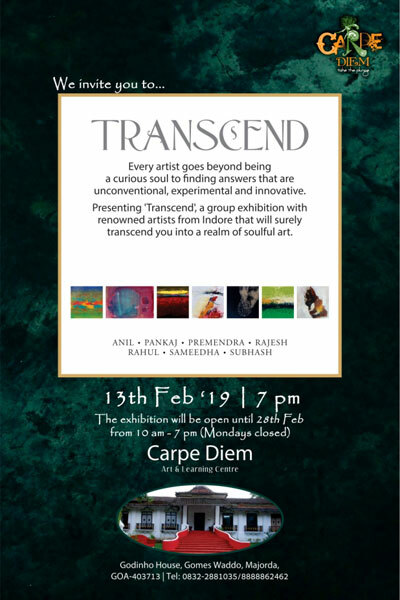 We take pleasure in inviting you to our next exhibition "Transcend" - an exhibition by artists from Indore! We look forward to your presence & support! A graduate from Indore School of Fine Arts, Shri Subhash Chouhan has developed the art of painting landscapes with a touch of impressionism that uniquely metamorphoses the stillness of serene nature into an environment alive with movement, like the rippling waves created by wind, swishing through a field. The paintings transcend the horizons of stillness and are animated by complementary choice of colours. Pankaj is a photographer and a painter. He paints in a style close to the impressionist school wherein intricate interplay of colours accentuates the shades of light. Pankaj looks to nature for the subject of his works. He creates a harmonic blend between the aging beauty of historical sites and the elements of nature that have blanketed them in close concert, creating a mystical and mythical mix of earthly and divine. Rajesh Sharma with a background in commerce, holds a National Diploma in Fine Arts from the Devlalikar School of fine Arts in Indore. He chooses to paint nature and his landscapes come alive with the short strokes of his knife. Rajesh symbolizes grandeur through his artistry. His creative sense and methods express themselves through his contemporary art style. An M.F.A. in painting from Government Institute of Fine Arts, Indore, Premendra is known for his abstract artworks in which the colours - be it green, blue, white or saffron highlight a certain cognition of nature. Nature which is untouched and unexploited by mankind is serene in every sense of the word. Premendra’s paintings suggest that the artist is “Shiva”, the supreme God, who has imbibed in himself all the worldly toxins to spread the canvas with the elixir of life. Anil Sharma reflects the different moods of our natural surroundings through his paintings. Over time Anil has developed a distinct signature style, with strokes immersed in the hues of seasons and surroundings. His paintings offer a world of sensual delights, such as the flickering of light off water, the changing colours of the sky, the miraculous multitude of colours, lines and forms in nature. Sameedha Paliwal, a young artist from Indore is a M.F.A. graduate From G.I.F.A Indore (M.P.). Sameedha gains her inspiration from the burning sun at dusk, the reflection of the moon shinning in the water, the various shades of blue in the sky, various aspects of travelling, silence and love. She prefers working with bright liquid colours which she blends on the canvas and uses the flow of colors to obtain the various kinds of patterns she wishes to create. Rahul Solanki, a graduate of Govt. College of Fine Art, 2003, Indore. The medium of his work is paper collage. His work is created with fragments of paper and recycled imagery collected from my daily life and wanderings. His works on paper help him piece together the past and make up the parts he does not know. I am especially intrigued with colors, textures, shapes, and negative spaces in everydaymaterials. The process of then re-integrating many pieces, to create something completely new, is an intuitive and ongoing visual experiment.